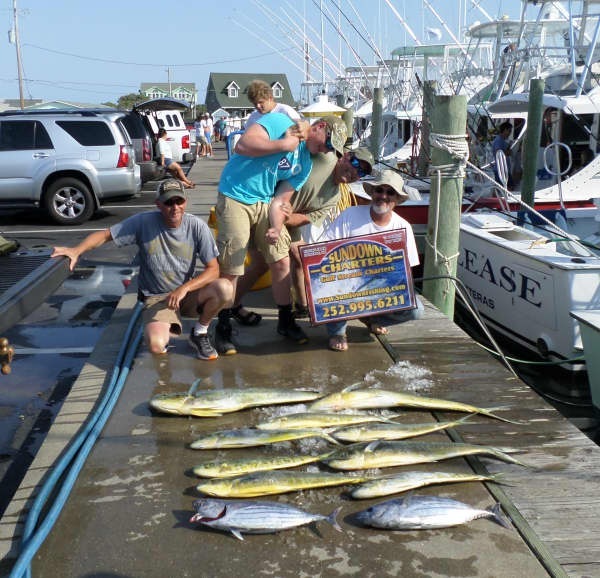 Welcome to the Hatteras Harbor Marina Fishing Report. 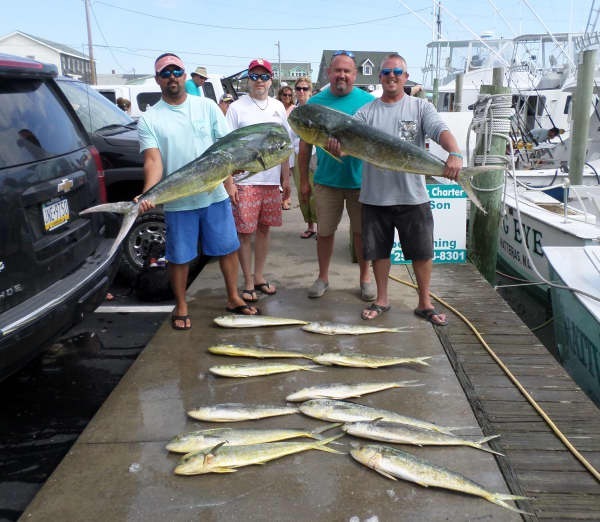 Our fishing reports appear just below these photos. 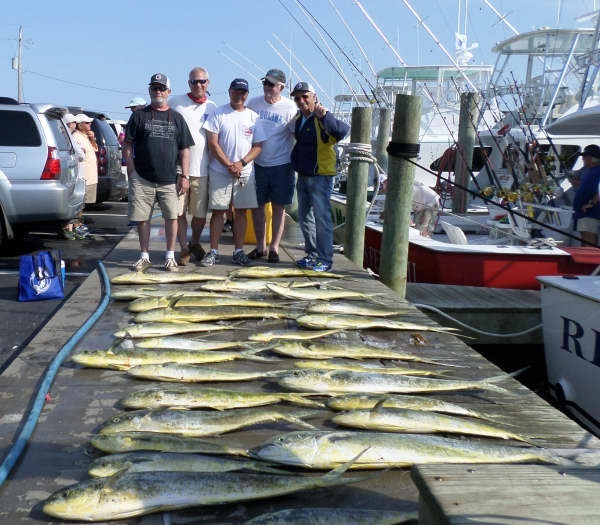 Be sure to visit this page daily for current fishing reports and photos. Thank you and good fishing! Lots of Tuna Salad there! Select the following text (right click and select all), then copy the text (right click and copy), then paste the text into the code of your site. The fleet was booked again for another beautiful Spring day of fishing. 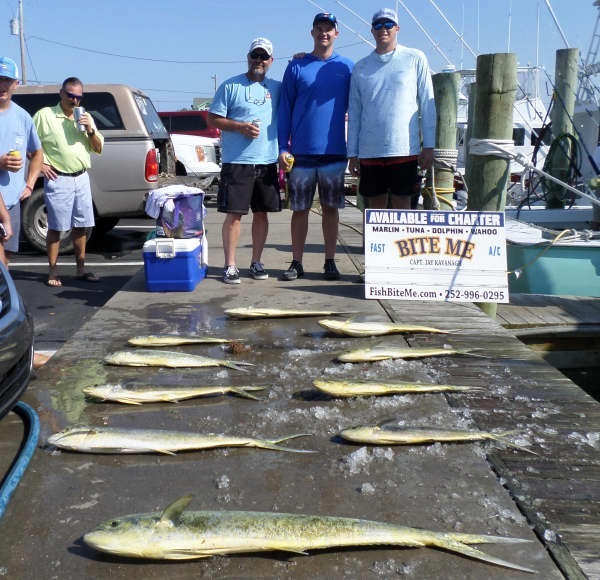 Inshore anglers had an epic day fishing for Spanish Mackerel. We had quite a few family groups that took the youngsters along and they all returned with great catches, full of excitement. The Billfish bite came on good offshore. Our offshore fleet released two Blue Marlin, two White Marlin, and five Sailfish. Way to get on the fish guys! The dolphin bite continues to produce some great catches. 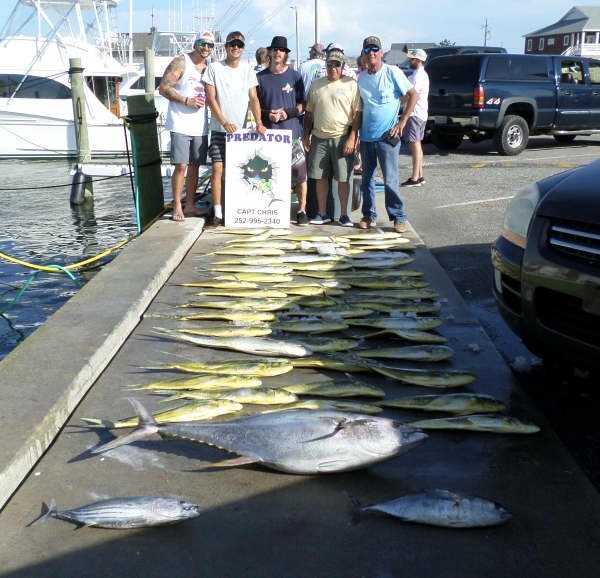 Blackfin Tuna fishing improved and helped to vary the catch. 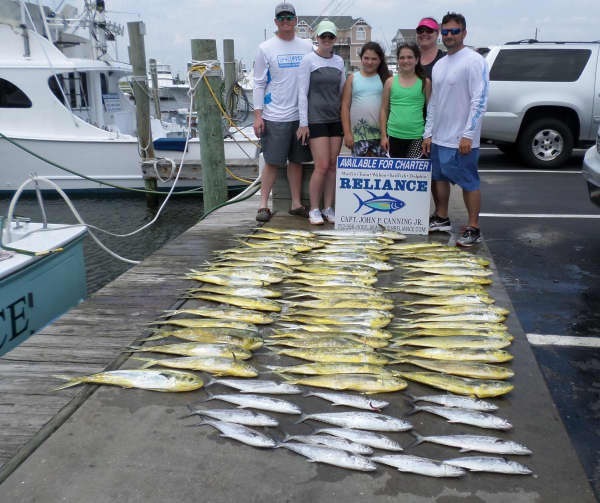 Add to that Triggerfish and Tilefish to grill on the BBQ and there will be a taste sensation for everyone! Tomorrow is supposed to be even better weather and our fleet will be busy again. 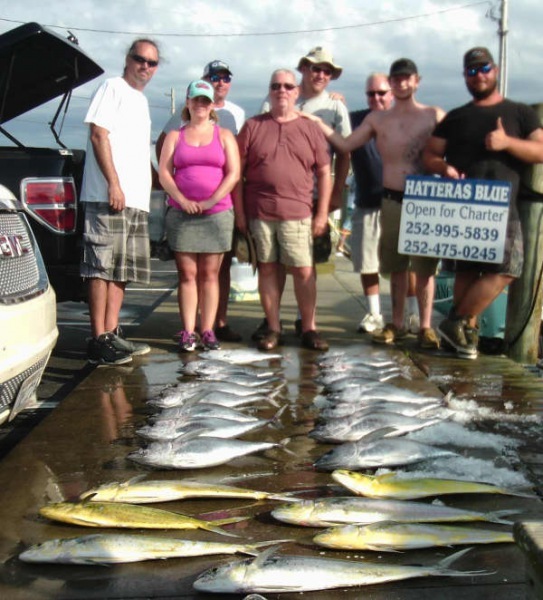 Don't miss out on all the fun - give us a call at 800-676-4939 and we'll hook you up with a fishing experience of your choice. 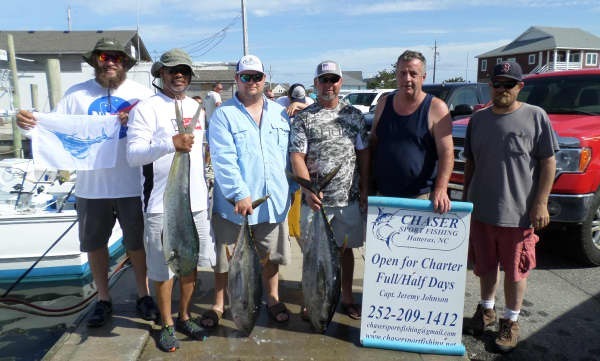 Curtis Carvell of Lititz, PA: Sailfish release on Bite Me. Dereck Hench of Lititz, PA: Sailfish release on Bite Me. 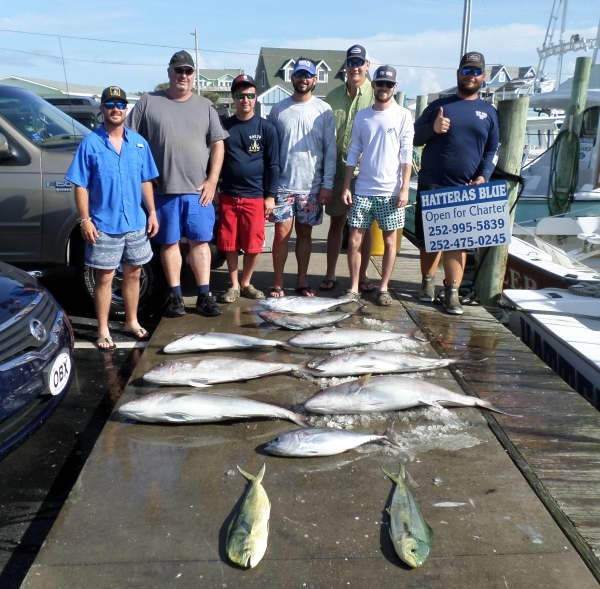 Clayton Carvell of Lititz, PA: Sailfish release on Bite Me. Kade Sutton of Holladay, UT: Sailfish release on Gambler. Cindy Cook of Holladay, UT: Sailfish release on Gambler. 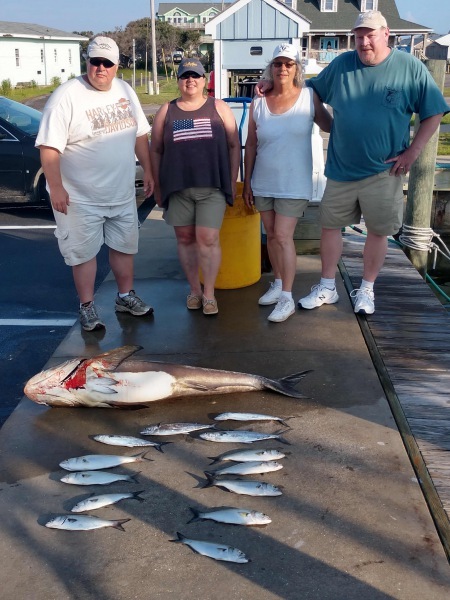 Denise Weller of Denver, PA: White Marlin release on Chaser. Chip Cook of Suffolk, VA: 46 lb. Grouper on Good Times. Robert Preston of Batesville, IN: White Marlin release on Sundown. 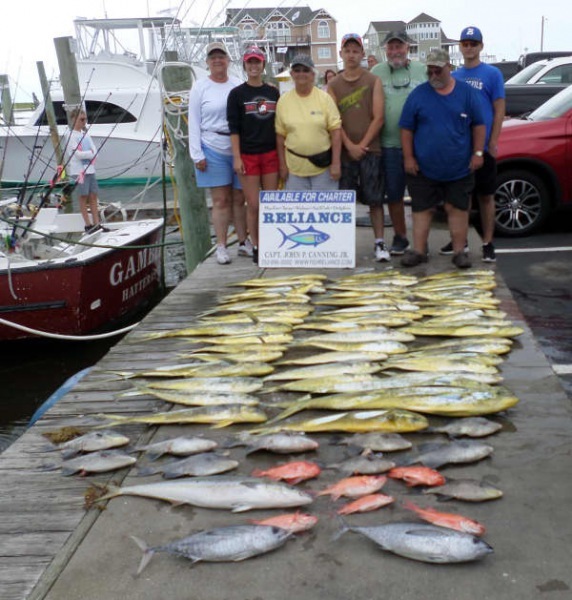 It has been a fisherman's paradise in Hatteras. 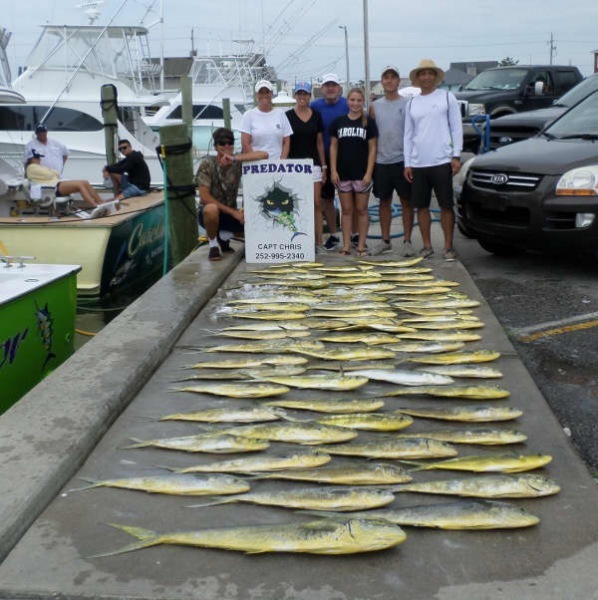 Every boat except for the ones that took a lay day for the Big Rock tournament fished out of Hatteras Harbor today. 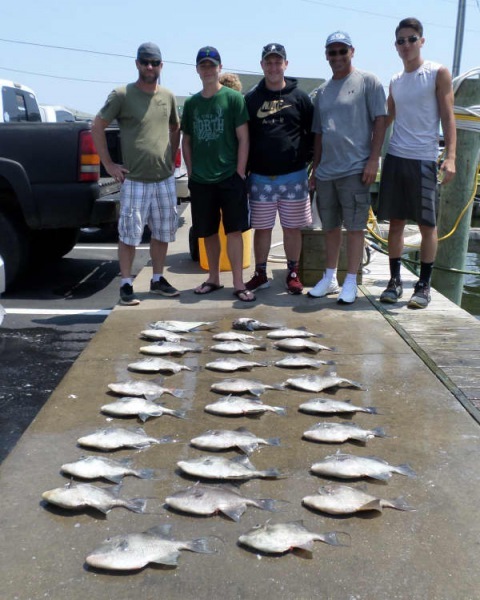 Inshore anglers experienced a good Bluefish bite. 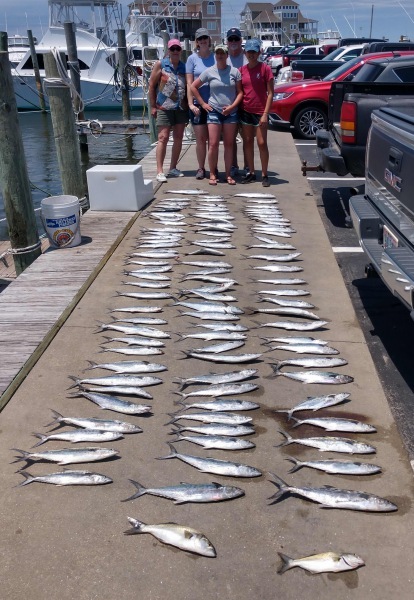 A few Spanish Mackerel were caught in the Pamlico Sound. One boat fished near shore and kept a couple of young ladies hopping on a good Spanish bite! Check out their picture. 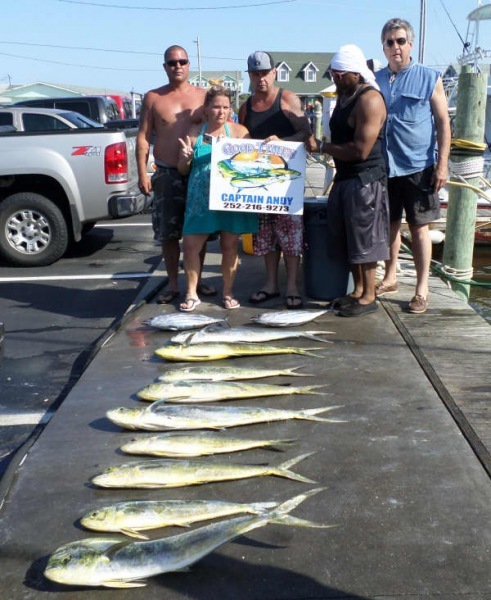 The Dolphin bite did not disappoint offshore anglers and most charters returned with limits. 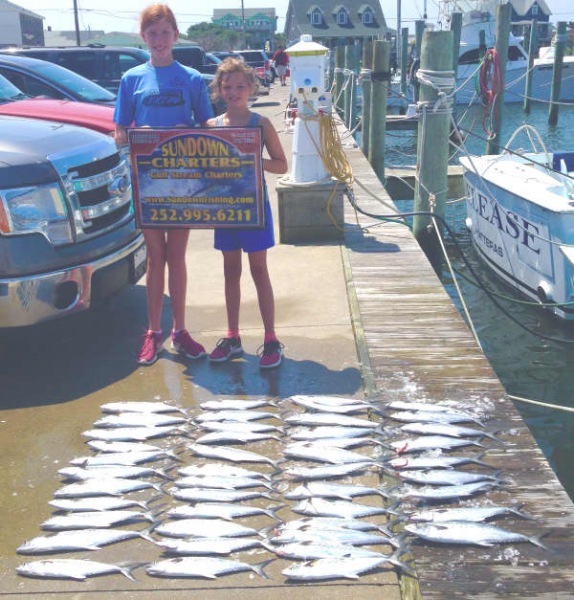 The King Mackerel bite was scattered. It was a pretty sight with all the empty slips during the day and boats docking this afternoon with happy anglers and their ample catches. The Billfish bite slowed down quite a bit today. To see the latest results of the Big Rock, check out the Big Rock website along with the live webcam. 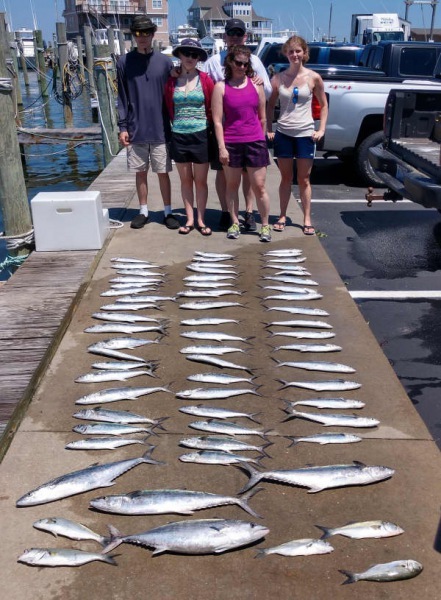 Our inshore fleet was out and about today in the Pamlico Sound catching Spanish Mackerel and Bluefish this morning. 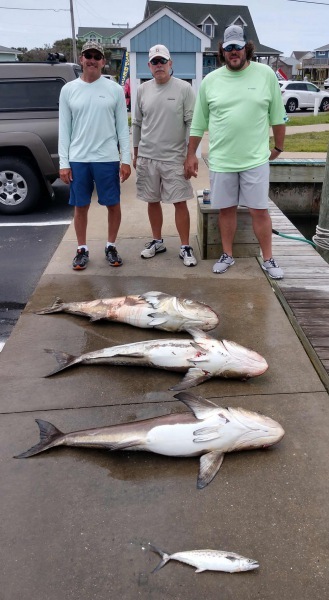 The afternoon was spent battling Cobia. 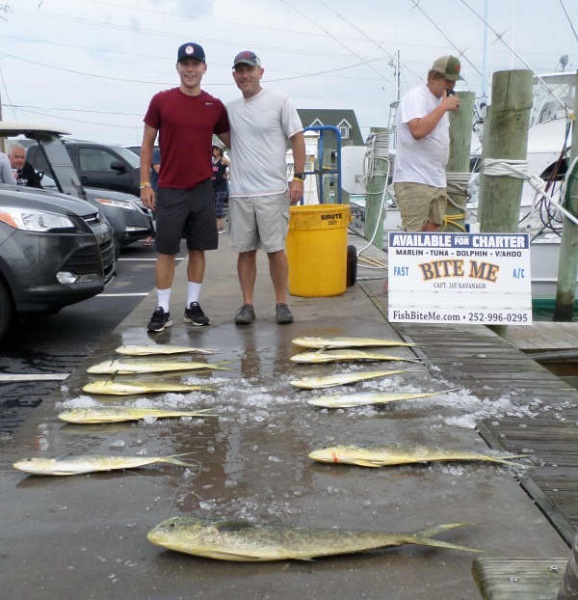 Inshore trips run half day charters and are a great way to introduce young anglers the ins and outs of fishing, plus it is enjoyable for everyone. 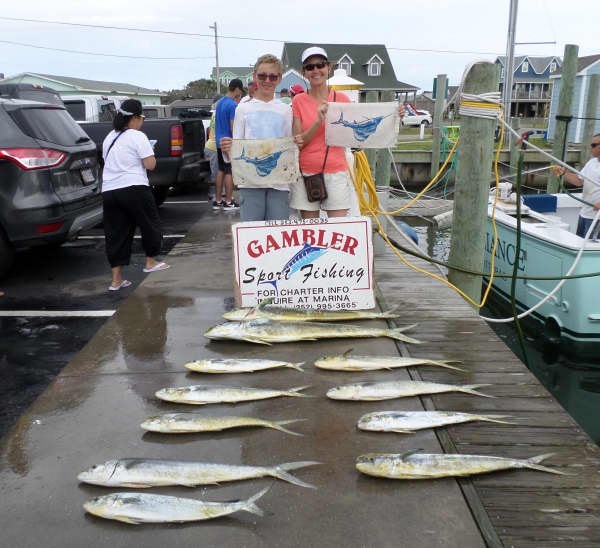 One boat fished near shore and they were successful with Spanish Mackerel, Bluefish, and Amberjack. 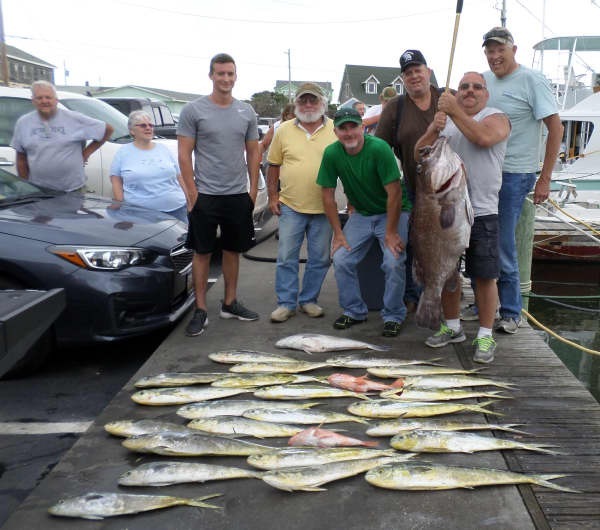 Several boats fished offshore and they reported some squally conditions out at sea. 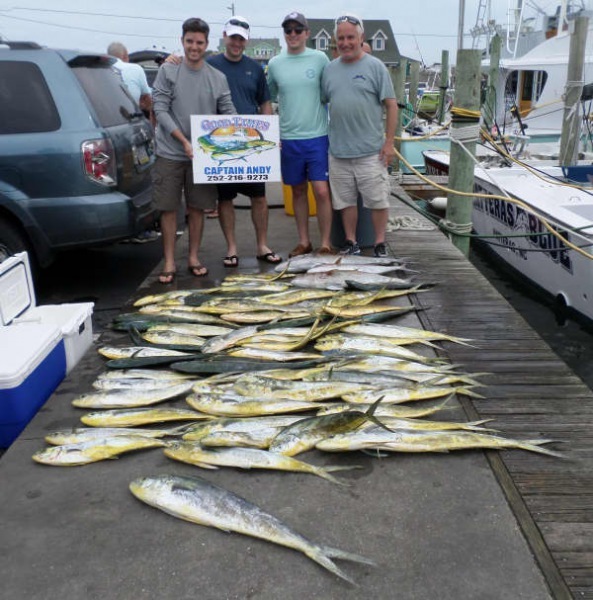 The Dolphin bite was excellent today and boats returned with limits of mostly bailers. Bite Me released a White Marlin. 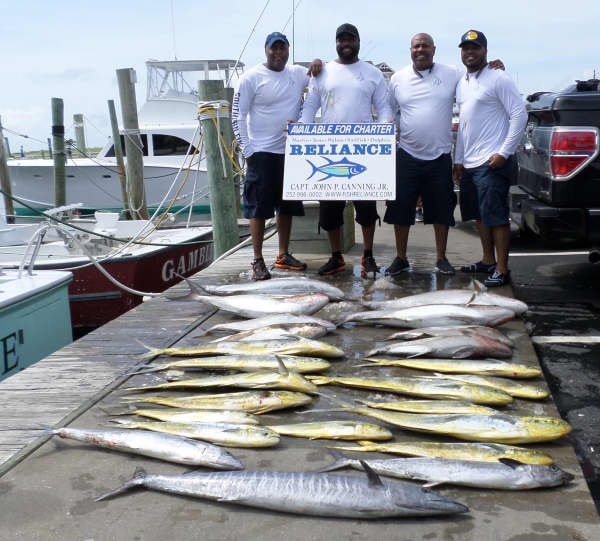 The Big Rock tournament is underway and you can get the latest results on their website. Don't forget to check it out! Josh Spicer of Julian, PA: 74" White Marlin release on Bite Me. Only boats fishing Offshore today were fishing the Big Rock tournament. 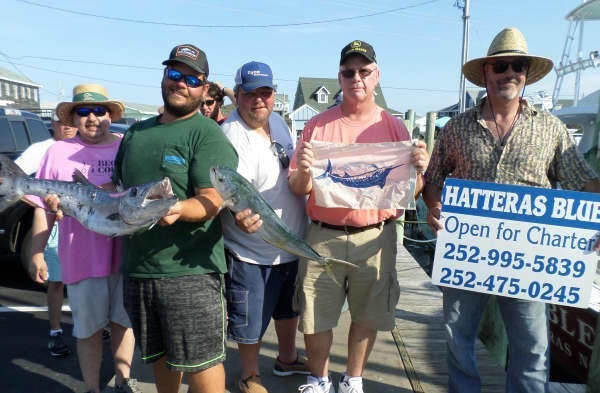 Congrats to Hatteras Fever on releasing a White Marlin!. 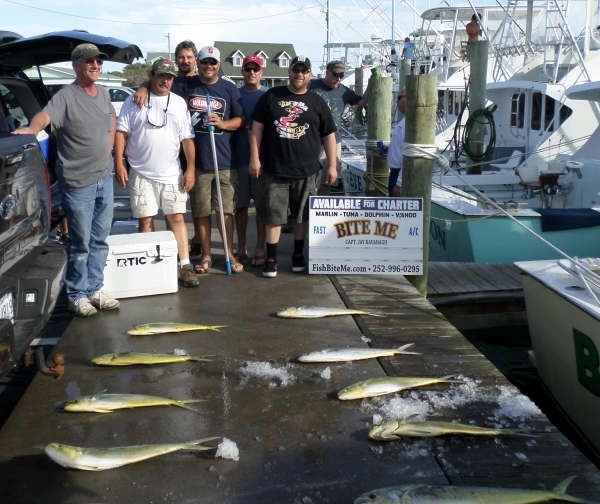 Inshore boats found Spanish Mackerel and Cobia. 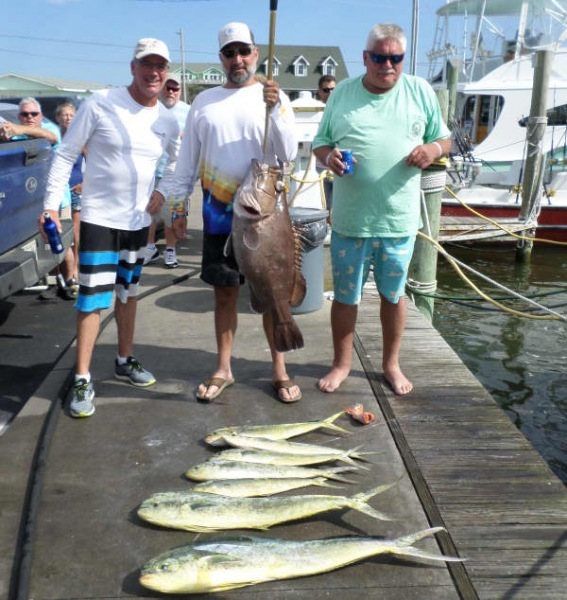 Fingeance: Patrick Foltz of Charlottesville, VA caught a 47lb Cobia. Childs Campbell of Luray, VA caught a 67lb Cobia. Morning started out a little cool but fair, late afternoon however was a different story. Unexpected storms moved in with downpours and lightning. Boats headed in early and the afternoon Inshore trips were scrapped for the day and most moved dates to a hopefully better weather day. Our Offshore fleet did make a day of it with boats bringing in a lot of bailer(smaller) Dolphin with a few gaffers (larger) mixed in. 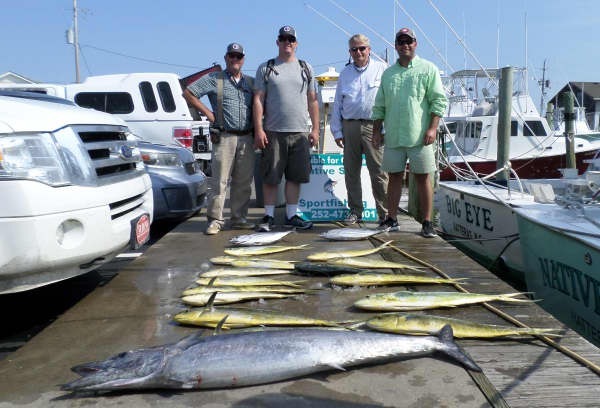 Some boats had a really excellent catch of Blackfin Tuna. The makeup trip was pleased with their catch on Native Son. Lots of boats out today enjoying a light breeze and blue skies. 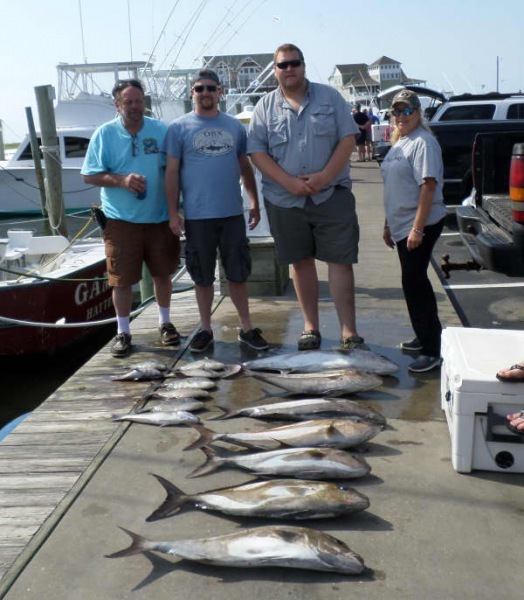 Inshore boats were filling up with Bluefish and Spanish Mackerel and a few Red Drum releases. 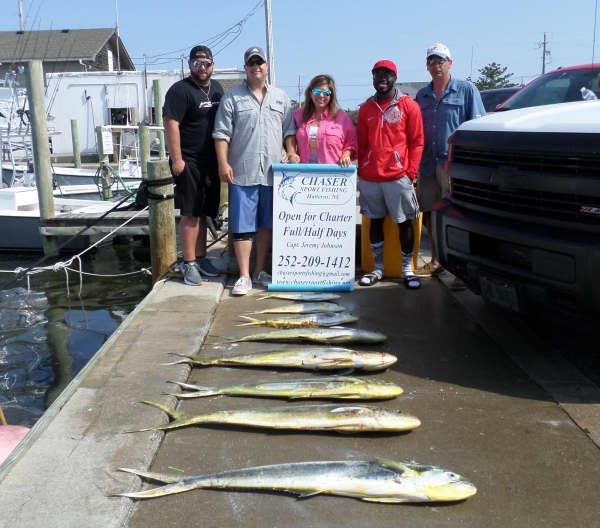 Offshore boats were putting good catches of gaffer and bailer Dolphin. 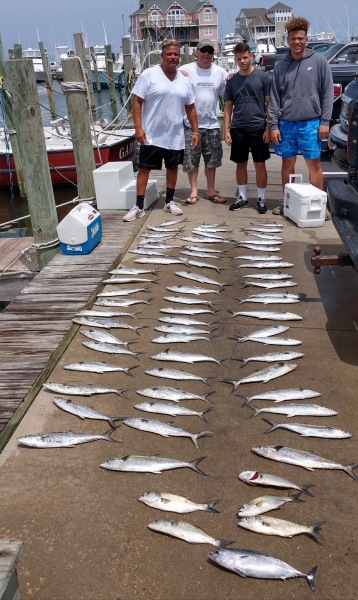 A few Blackfin Tuna were in the mix. Despite a morning shower the day was beautiful off the coast of Cape Hatteras today. 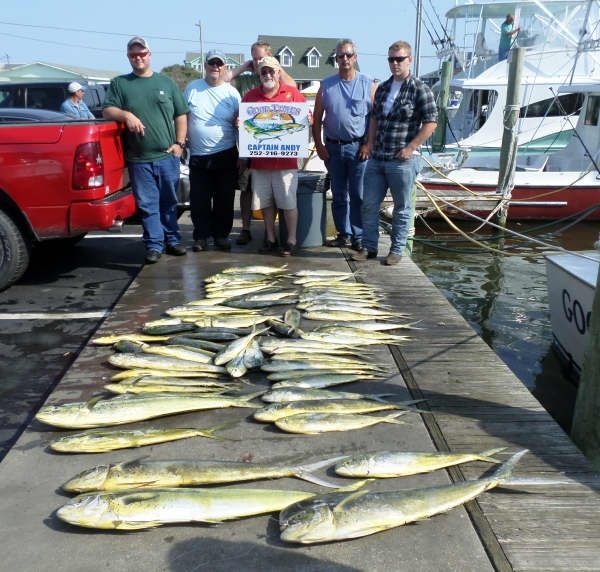 Offshore boats reported fair fishing with gaffer and bailer dolphin. 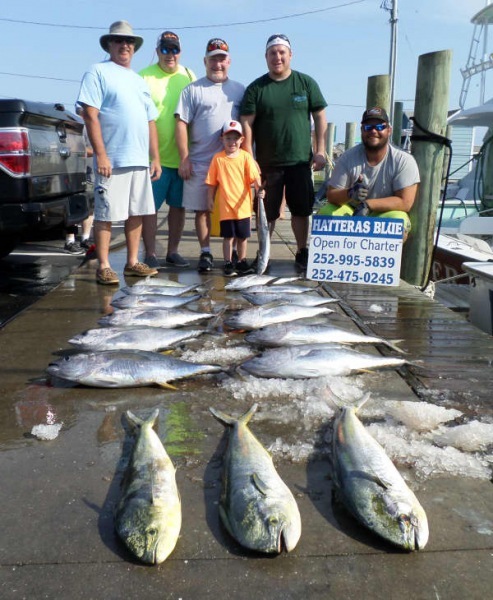 There were scattered Yellowfin and Blackfin Tuna. There were also a few Wahoo on the hook. 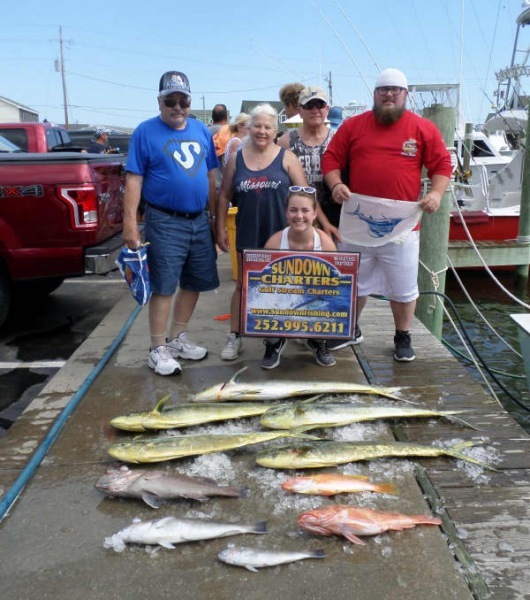 Deep water and shallow water bottom fishing scored Grouper and Snapper. 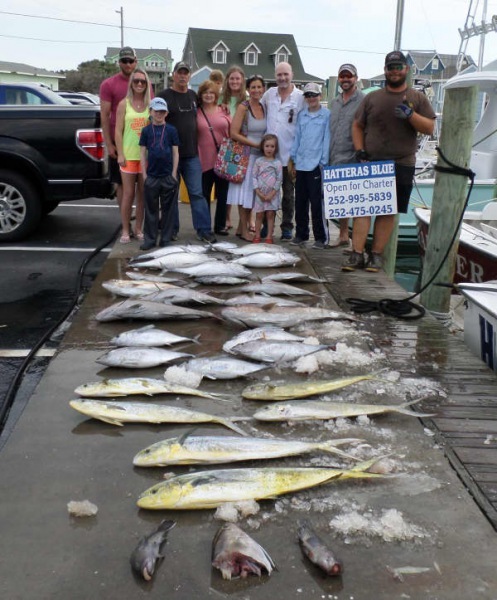 Hatteras Fever released a White Marlin and Chaser released a Sailfish. 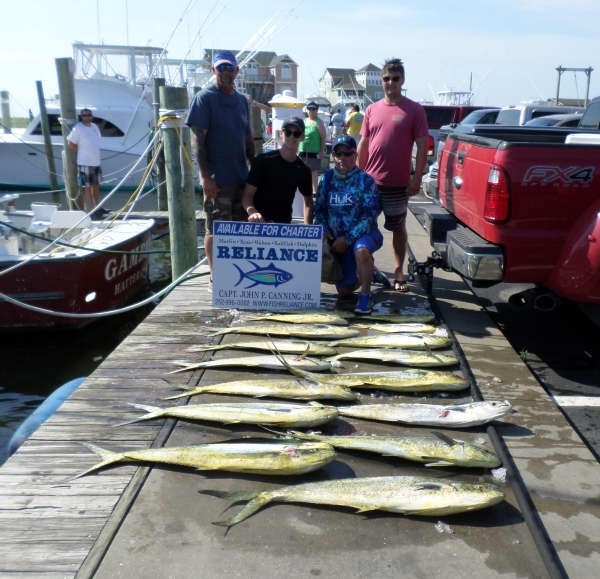 Inshore boats found excellent Spanish Mackerel fishing and a few Cobia. Blue skies and fluffy white clouds were the view for most of the afternoon if you weren't here you missed it, don't miss the next one give us a call to get you out on the water. 1-800-676-4939. 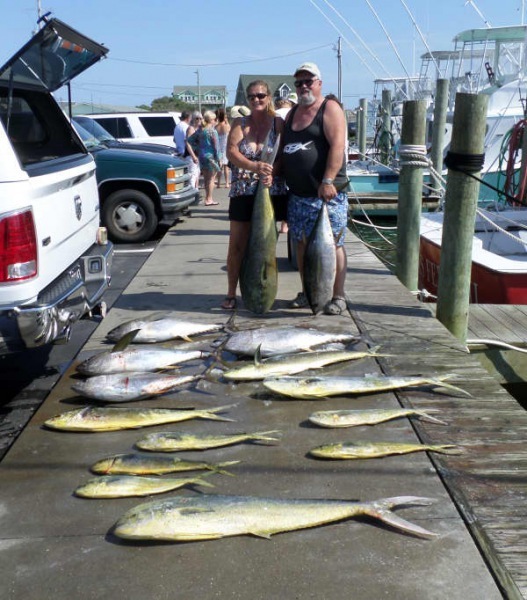 Tradition: Kim Havens of Midlothian, VA caught a 46lb Cobia. What gorgeous late Spring weather! Once again almost every boat in the marina headed out on the water with groups of anglers fishing inshore or offshore. 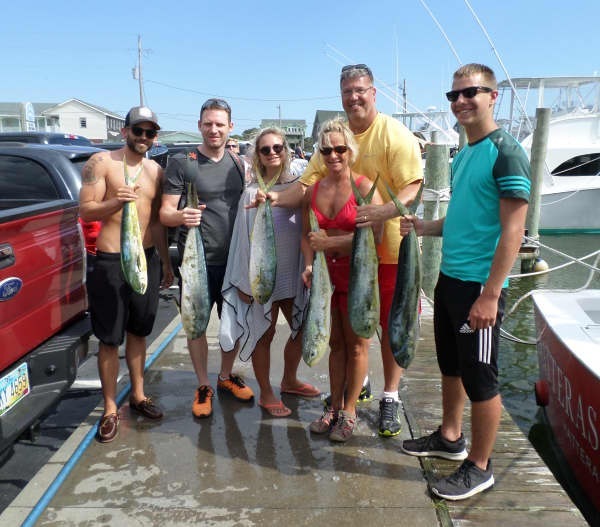 There continues to be an excellent Spanish Mackerel bite inshore. 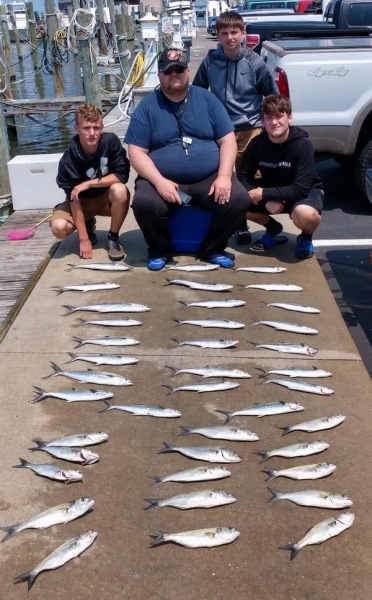 Bluefish were biting as well. 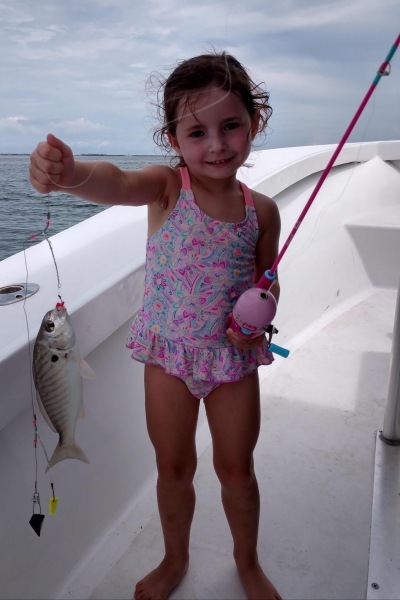 Schools of Red Drum were found and put anglers to the test catching/releasing on small tackle. 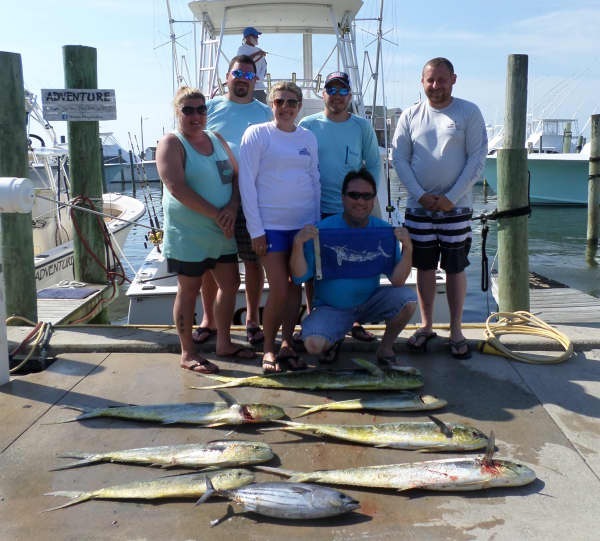 Inshore boats offer half day or full day trips fishing the Pamlico Sound. The story offshore was a real good Billfish bite! Overall, three Blue Marlin, one White Marlin, and one Sailfish were released by our fleet. Many others were hooked up by other marinas and transient boaters. 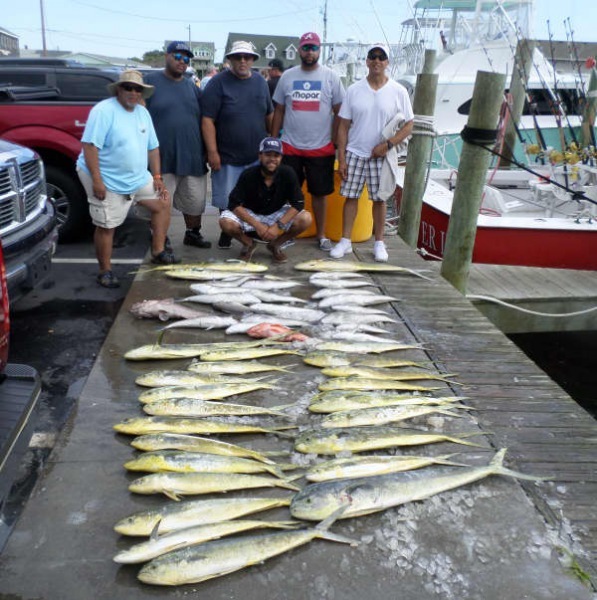 The Dolphin bite was fair to good, Yellowfin Tuna made a scattered catch, a few Wahoo, and a few King Mackerel leveled out the fish box. The dock was full of happy, sunburned, and tired anglers this afternoon. 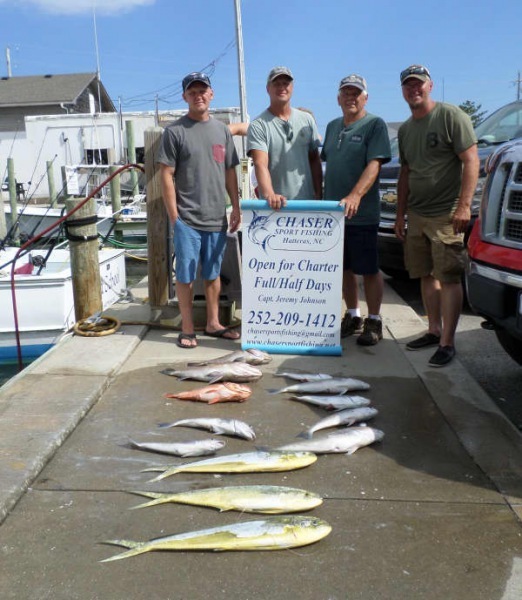 Our offshore fleet returns between 4 - 5 p.m.. Come on down and see what's thrown on the dock! Kevin Ryan of Berryville, VA: 40 lb. Cobia on Hang On. 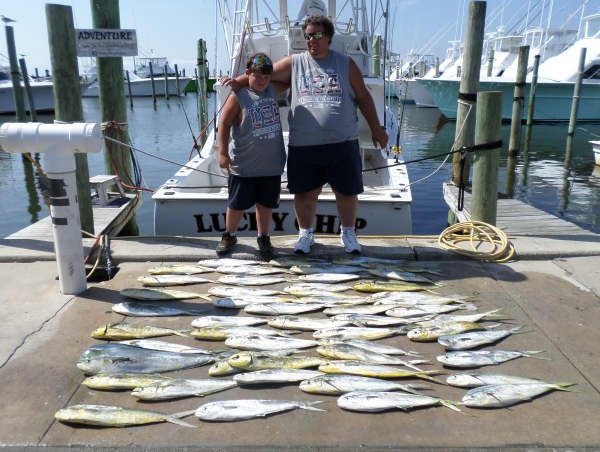 Richard Beckman of Elizabeth City, NC: White Marlin release on Lucky Chip. Joan Olson of Hickory, NC: Blue Marlin release on Sea Creature. John Olson of Hickory, NC: Sailfish release on Sea Creature. Jason Boivin of Deerfield, OH: 38 lb. Dolphin on Sundown. 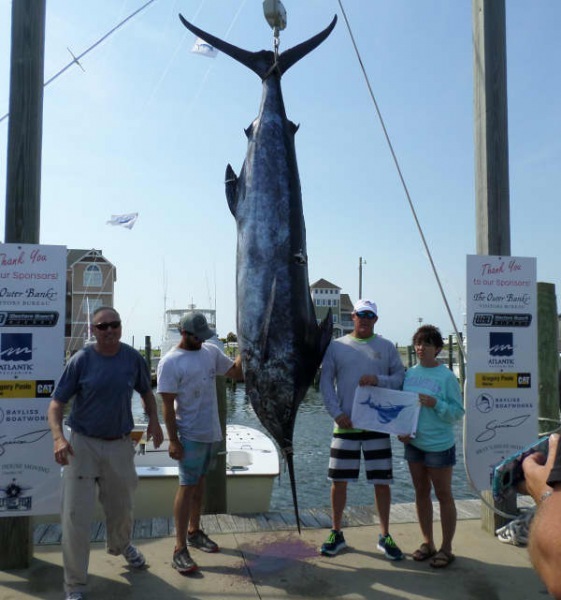 Jeffrey Colvin of Louisa, VA: 85" Blue Marlin on Hatteras Blue. Anthony Normant of Parma Hts., OH: 21 lb. Blackfin Tuna on Hatteras Blue. 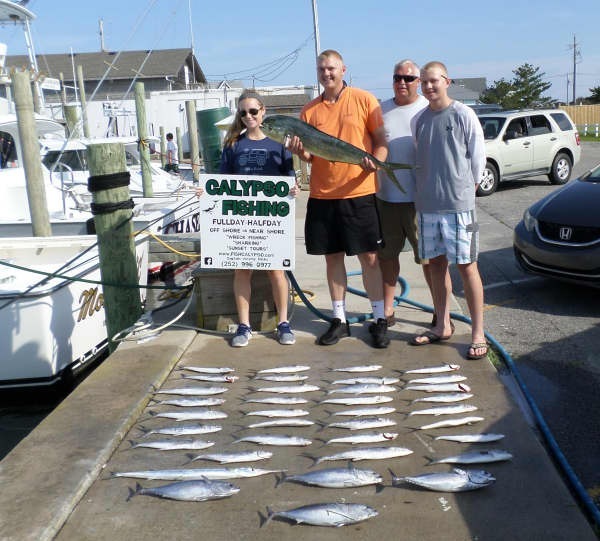 Abundant sunshine, cool air from the NE, and everyone in the fleet fishing! A full house went out today and the fishing did not disappoint. 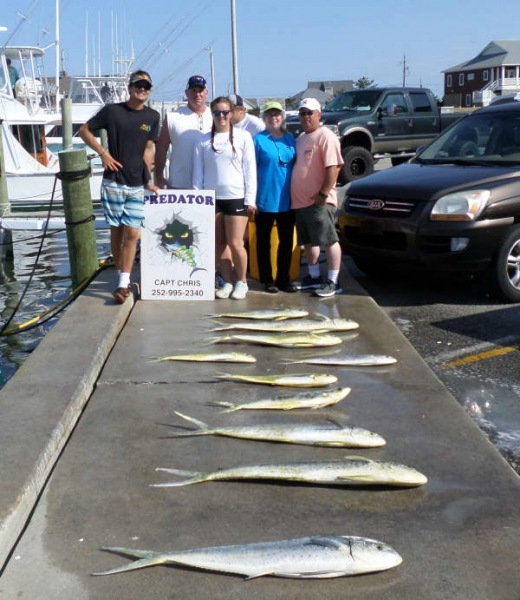 Inshore catches consisted of Spanish Mackerel, Bluefish, and Bonita Mackerel. All anglers returned with fish in hand and smiles all around. 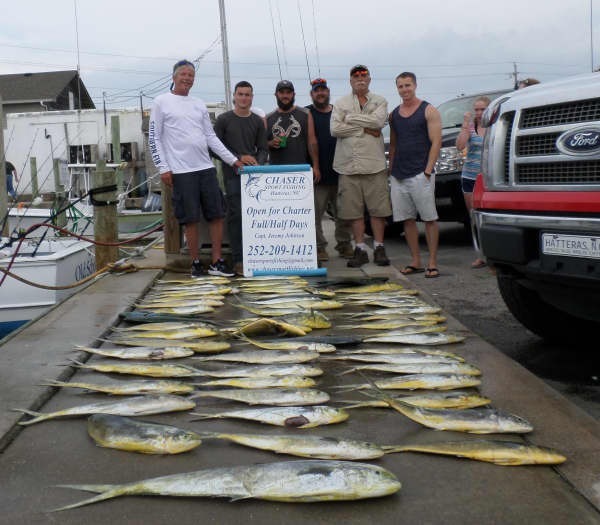 The Dolphin bite picked up again offshore with bailers and gaffers filling up the box. The Blackfin Tuna bite was scattered, showing they're still around. 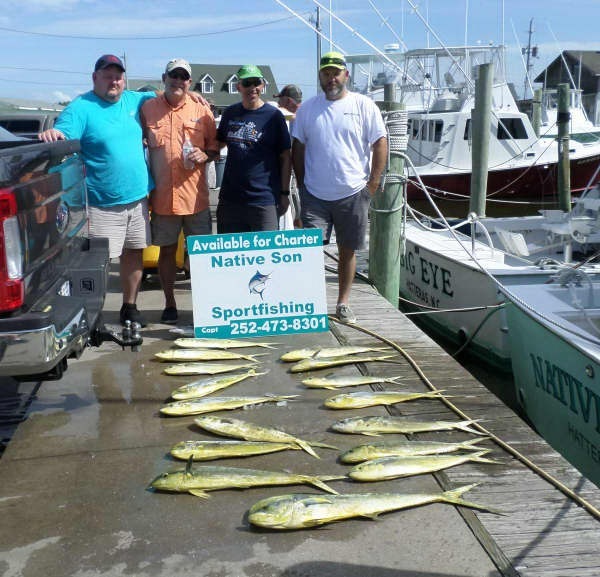 Bottom fishing included Triggerfish and Tilefish. 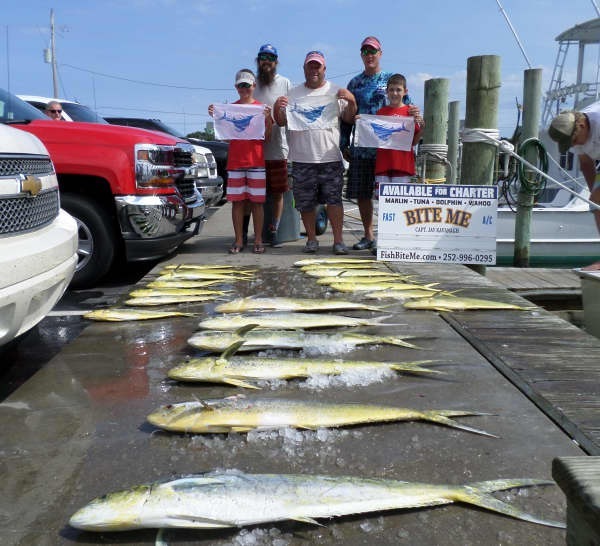 One Blue Marlin was boated by Bite Me. It weighed in at 596 lbs. and was 124" in length. Three Sailfish were released - one by our own Brothers Pride. 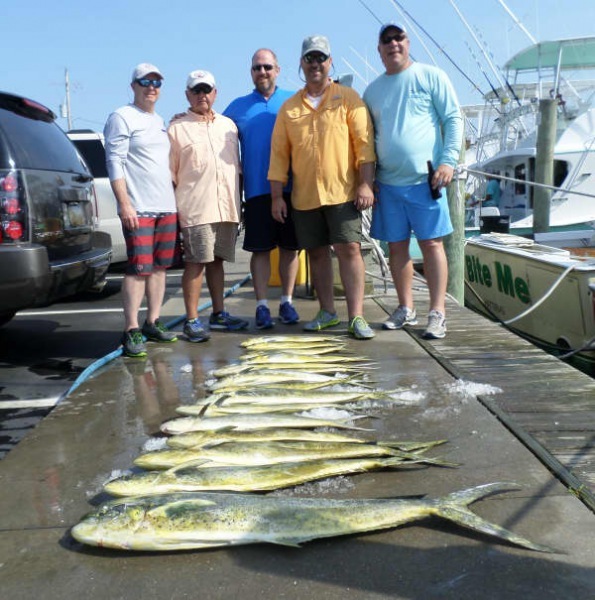 Sounds like anglers had an excellent experience wherever they fished! 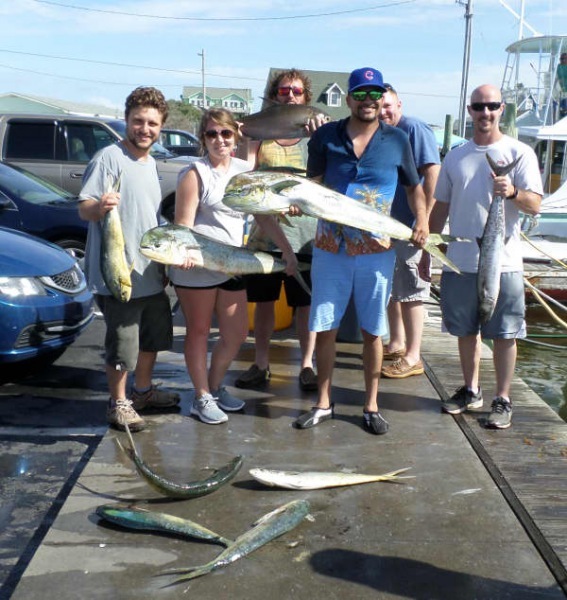 Logon Walker of Berlin, PA: Sailfish release on Lucky Chip. Thomas Platt of Damascus, MD: 38 lb. Dolphin on Tuna Duck. Lance Parker of Smyrna, DE: 596 lb. Blue Marlin on Bite Me. 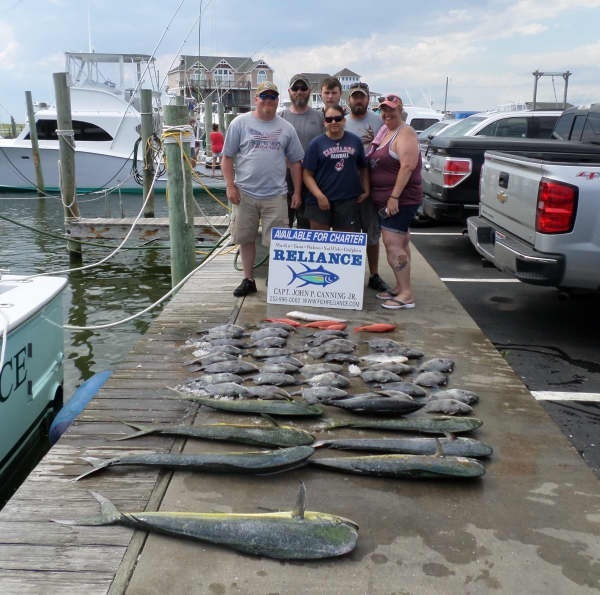 Lance Parker of Smyrna, DE: Sailfish release on Bite Me. Andrew Bennett of Apex, NC: 51 lb. Wahoo on Native Son. We are currently looking for 2 to 3 people to fill a make up party for tomorrow, Thursday June 7, give us a call if you are interested in going. 1-800-676-4939. 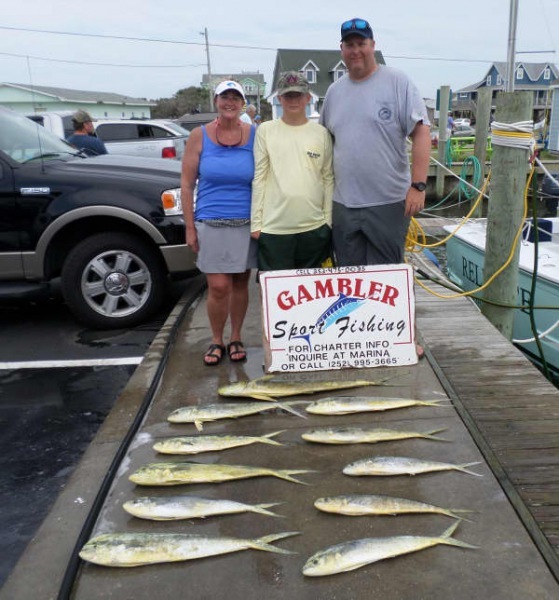 Anglers fishing the Pamlico Sound today were kept busy catching Spanish Mackerel, Bluefish, and Bonita Mackerel. 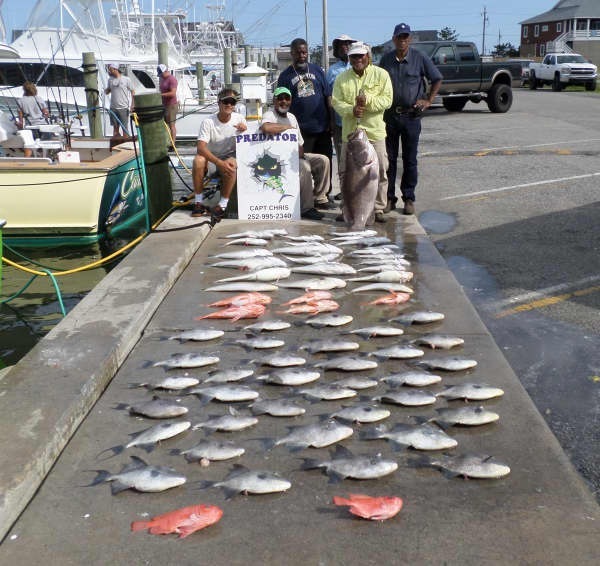 There were several Red Drum releases. 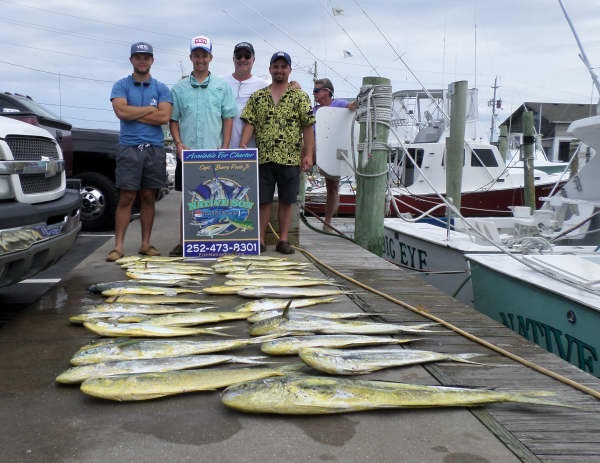 Inshore trips run in the morning and again in the afternoon. It is a great way to entertain and educate children of all ages! Fishing was slower offshore today. 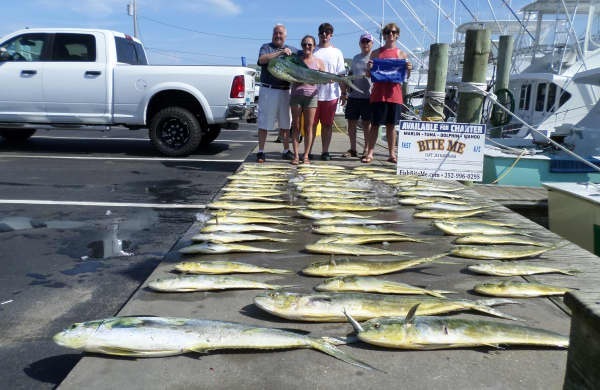 Anglers got into scattered catches of King Mackerel and Wahoo. 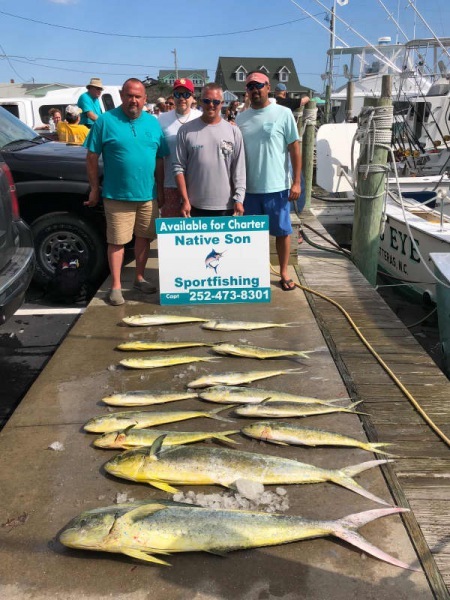 The Dolphin bite was scattered, but most boats managed to scrap out a fair catch. 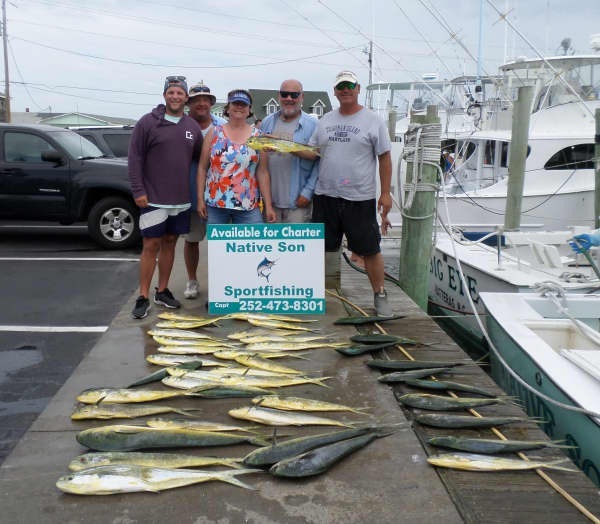 Bottom fishing was good with Triggerfish and Tilefish. 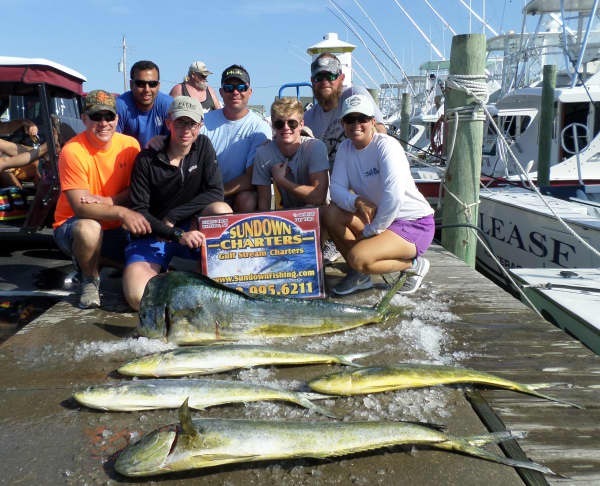 Sundown and Gambler released Sailfish! Way to go guys! Lydia Allen of Kingsport, IN: 44" Red Drum release on Sound Bound. Michael Wagner of Mt. Holly, PA: 35 lb. Grouper on Good Times. Ronald Weber of Cleveland, OH: 46" Red Drum release on Tradition. 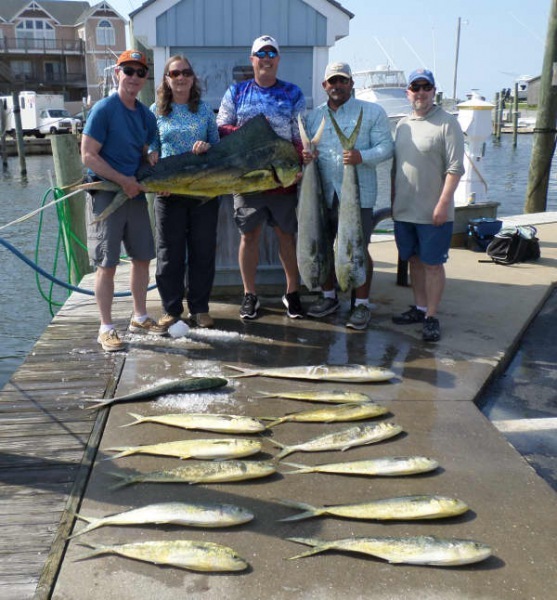 Chris Day of Nags Head, NC: Sailfish release on Gambler. Michael Tribble of Odessa MO: Sailfish release on Sundown. Henry Cypress of Baltimore, MD: 54 lb. Grouper on Predator. 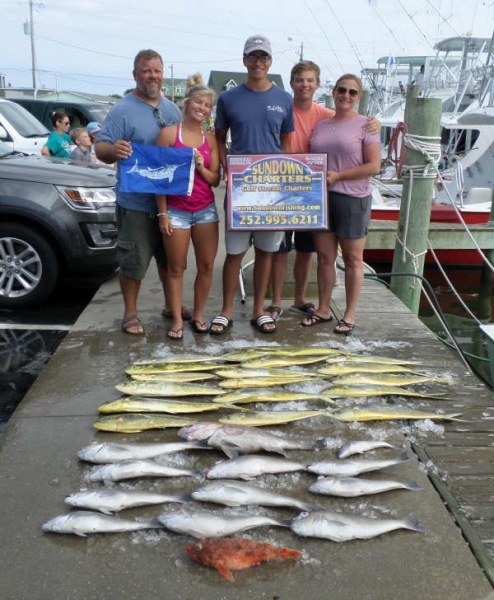 Copyright © 2011 - 2019 Hatteras Harbor Marina and Its Licensors. All Rights Reserved.